Is It Worth Going On? So many hard things to deal with in life. So many disappointments, grief and heartache combined, make us feel sometimes that we can't go on--that we can barely breathe. I've been digging into my ancestors. It started as just to find some background for my own writing. Then, it got personal, and I'm trying to sort it all out. What is God calling me to write? After that, a tragedy happened in our community where a woman was shot to death by her estranged husband and then he killed himself. I knew her. My boys worked with her. I talked over colleges and careers with her and her daughter. It reminded me of the many times I came close to being killed in much the same manner as she was, but for some reason it never happened. Bullets flew by my head, but never touched me. Night after night of endless talking my tortured father from committing suicide and taking us with him. It was a time of my life full of pain and suffering emotionally, but I lived. I survived. I'd go to church and school afterwards, smile and not talk about it. This woman did not get that chance. I have no answers for that. In times of grief and suffering we often question if we can go on. The opposition and obstacles are great; we are unsure of survival. Is it worth the risk? Life is like that. It is full of risk but not everyone takes it. Everyone has a life with these same questions and risks, and we often question if we can go on knowing what we do, but also not knowing. Frodo Baggins: I can't do this Sam. Sam Gamgee: I know. It's all wrong. By rights we shouldn't even be here. But we are. It's like in the great stories, Mr. Frodo. The ones that really mattered. Full of darkness and danger, they were. And sometimes you didn't want to know the end. Because how could the end be happy? How could the world go back to the way it was when so much bad had happened? But in the end, it's only a passing thing, this shadow. Even darkness must pass. A new day will come. And when the sun shines it will shine out the clearer. Those were the stories that stayed with you. That meant something, even if you were too small to understand why. But I think, Mr. Frodo, I do understand. I know now. Folk in those stories had lots of chances of turning back, only they didn't. They kept going. Because they were holding on to something. Whatever you are fighting for, keep fighting. Whatever has you in the grip of that despair or struggle, it's worth going on. Rest if you must. Take a deep breath. Clear your head. You are holding on. Don't give up. Never give up until God calls you Home. One week ago today, Nancy J. Ring took the path Home and went to meet Her Lord and Savior. She was a part of many circles, but she was also a part of our circle, which started off as a writers' critique group, Struggling Artists of Literary Talent (SALT.) We bonded as sisters in so many ways, and now we are heartbroken that we can no longer be a part of her life, nor she a part of ours in this life, except for the wonderful memories we have--but yet, we are eternally connected as we are also sisters in Christ Jesus. We will see her again. One way we are honoring her is by writing how she became a part of us. This is by SALTy sister, Marti Suddarth. 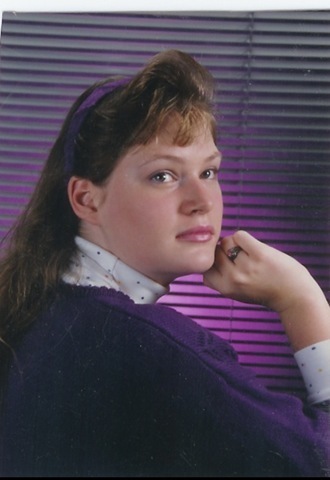 I didn’t know Nancy Ring when she was in high school - we lived in different states and attended school in different decades – but when I think about Nancy, I always think of her senior picture.She’s wearing purple, her favorite color, and looking over her shoulder at the viewer.Even though she’s only seventeen-or-eighteen-years-old, she looks so determined.It’s not just youthful enthusiasm, that naive belief in one’s own invincibility that so many high school seniors feel.There is an inner strength in her eyes, a confidence that comes from knowing Who is in charge, Who is guiding, Who is taking care of her. Nancy and I were both members of SALT – Struggling Artists of Literary Talent, a small group of writers who provided support in the form of critiques, information, advice, shoulders, and most importantly, prayer. In the eleven or so years our group has been together, we’ve gone from fellow writer-wannabees to published authors and close friends.In that time, I’ve repeatedly been amazed by Nancy’s wisdom.I shouldn’t have been.It was apparent in her eyes.How could someone “so young” –ack! Who wants to be described that way? – be so wise? Yet her advice was always spot on.She was the grounded person I wish I was.It’s hard to imagine that she benefited much from my friendship, but I gained so much from hers.“Nancy” means “grace.”She was appropriately named. This is not to say Nancy was an all business-fuddy-duddy! (The truly wise know the importance of having fun, too! 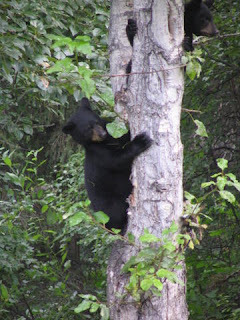 )She collected teddy bears and played with her cat, Katerina.Nancy loved looking for rainbows, and every spring, she eagerly reported her first lilac sighting. Nancy loved lilacs. Toward the end of the Star Trek: The Next Generation episode titled, "Skin of Evil," the crew members attend a memorial service for security chief Tasha Yar, who has died in the line of duty. After the service, Data, an android who wishes to be more human, questions Captain Picard about the service. He asks, “I find my thoughts are not for Tasha, but for myself. I keep thinking, how empty it will be without her presence. Did I miss the point?" (Star Trek: The Next Generation: "Skin of Evil," original air date: 25 April 1988)Captain Picard responds that Data understood perfectly. I imagine Nancy (and a several of our mutual friends) laughing right now.I managed to write a Star Trek reference into HER memorial. Well, I understand Data’s quandary.I am sad for all the things that Nancy will miss, all the experiences she wanted but didn’t have.But at the same time, when I think of Nancy and imagine that senior picture, I can’t help thinking about how we’ll miss her – the stories she would have written, the joys that she always shared, and her friendship. I can’t help thinking about how empty we will be without her. Marti Kramer Suddarth is a computer and first grade teacher in southeastern Indiana.She is the author of Ping Pong Words and 30 More Children's Sermons (CSS Publishing,) and author/composer of "Broadcasting Christmas" and "Mini-Musicals for Special Days" (Contemporary Drama Service. )Marti is currently writing readers' theater scripts that coordinate with first grade social studies and science curriculum, and she "secretly" fantasizes about writing a cozy-murder mystery. Nancy brought gifts to the retreat for us: sleek Cross pens engraved with “SALT Sisters”; Bath & Body Works smell-goodies; and a small stuffed bear from her own collection for my little girl. Her generous heart was one thing that made her so special. A good writer, Nancy had several articles published. One, entitled “Because Mom Said I Could,” appeared in Tapestry magazine last October. It was a wonderful tribute to her mother’s tireless and faithful support. 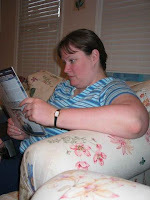 Nancy also wrote thoughtful, reflective posts for her blog. Her writing invited readers to think about the deeper things of life. She posted lots of quotations, something she and I both loved, and we occasionally sent especially good ones to each other. She was also my accountability partner, and for a time, we emailed weekly reports of the writing we had done and hoped to do. Like me, Nancy adored beauty. All winter in Chicago, she dealt with bitter cold and snow and long, dark days. She looked forward to spring and the first hint of lilacs blooming. 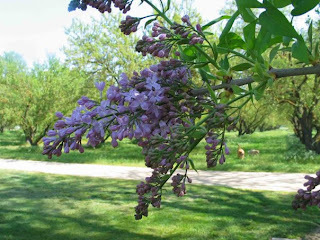 When she emailed SALT to say that she had seen and smelled her first lilac blossom of the season, I could hear the joy and relief in her words. Inside her cozy home, she created beautiful art books of intricate folds and gorgeous papers, with a well-chosen word here, a little detail there. When she finished, she sometimes gave those beauties of heart and hand to friends who she knew would appreciate them. A few months after her diagnosis, SALT sister Wendy and I went to see her in Chicago. We stayed in a hotel downtown so we could do the town like tourists. Nancy told us that her chemo, which she took every night after dinner, made her queasy, but she had discovered that a small piece or two of dark chocolate would settle her stomach. I celebrated that discovery with a few pieces myself and thanked God that her quality of life seemed intact despite the cancer. One day, Nancy and I went to Chicago’s famous art museum. We meandered through many of the galleries, lingering with the Impressionists. We chose our favorite paintings and discussed why we liked them so much. At lunch in the noisy, crowded cafe, we talked about art and beauty and writing and SALT. It was a short visit to Chicago, but one I'm so glad I made. 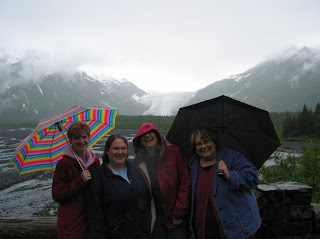 Last June Nancy, Wendy, and I converged on the home of fellow SALT member, Paula, in beautiful Alaska. Even though Nancy was ill then, she seemed to enjoy the trip to the fullest. Like the rest of us, she drank in the beauty of that wild land and took countless photos of the landscape. She wanted to see and do everything and didn’t let anything stop her. I remember one time on a cold, drizzly day, she stood looking at the water below and the mountains behind it while the rest of us huddled inside the car. She told us she wanted to build a house on that spot one day. 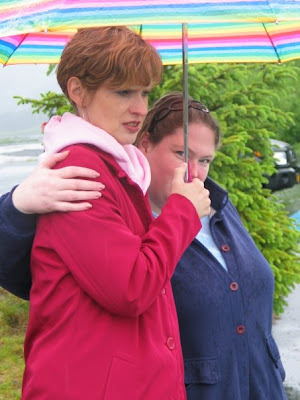 Later that afternoon, she and I stood together under my umbrella and marvelled at a glacier on the side of the road. Wendy took a photo of us, me looking at the glacier, Nancy smiling at the camera. When she became so sick last December, she wasn’t able to keep in touch with SALT by email or even talk on the phone much. I missed her. I missed her love for beauty and creativity. I missed her emails about the crazy antics of her gorgeous kitty Katerina. I wished we could sit around the table with our other SALTy sisters and share our stories, our writing, our lives. And of course our chocolate. She was never far from my thoughts and prayers. Even though I couldn’t be with her during the last few months of her short life, I know that our Lord and Savior was with her, comforting her and reminding her how very much she was loved. And now that she is gone, how very much she will be missed. We find comfort in the hope we have in Jesus because we know that we will see her again someday. See you soon, dear friend! LeAnne Benfield Martin is a freelance writer and speaker, wife and mom. She loves beauty, art, books, bookstores, writing, her family, her friends, her dogs, chocolate, and more. Whenever she has a piece of chocolate, she will think of Nancy and her SALTy sisters. Whenever she thinks of Nancy, she will think of Jesus, too, and will look forward to seeing them both someday. In the next couple days I've asked my SALT (Struggling Artists of Literary Talent) Sisters to write a few words about our good friend, Nancy, who died on Saturday, March 13, 2010. (Read yesterday's post to learn more about this remarkable writer.) We already miss her so much on our writers' Yahoogroup. Please welcome our founder, Teena M. Stewart, as my guest today.Teena is also the artist who created Nancy's logo which appears on her blog. When I think of Nancy I visualize a butterfly—a periwinkle blue butterfly, to be specific. 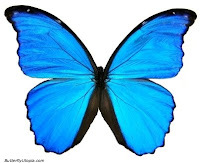 Periwinkle blue was Nancy’s favorite color and the butterfly--it symbolizes what she became. When she first joined SALT, our online writer’s group, she was very young, years younger than the rest of us. She shared a fantasy story that one group member fondly refers to as a Care Bear type of story. It was innocent and whimsical. Nancy had dreams of being published writer and she worked hard to perfect her craft—taking clues and suggestions from some of her published, older SALT sisters. The odds were stacked against her, but she’d been fighter all her life. Born with spinal bifida, she endured countless operations. I met her face-to-face several years ago at Mt. Hermon Writer’s conference. Young, and fresh-faced, her pale complexion and ruddy cheeks seemed to radiate a girl-next-door freshness. She was a determined young lady who didn’t let the hilly terrain of the location stand the way of getting to classes, even if it meant using her crutches uphill. She could take on the best of them. She was a fighter. She had to be. She fought to advocate for the clients she worked with in social services. She fought to make her way to the city bus in order to get to work in the frigid, snow-laden Illinois winters. She gritted her teeth and determined she would be a published writer while juggling full-time work and many other responsibilities. Before long she had several articles published. She dug in her heels and went for her master’s and we cheered her on, celebrating the triumph with a gift basket of goodies and a bespectacled Teddy Bear. For years she dreamed of having a place of her own, and she went without in order to set aside enough money to make a down payment. Before you knew it she had conquered that hill too and moved into her long-dreamed of condo. When she learned she had cancer, she clenched her teeth, rolled up her sleeves, and prepared for the fight of her life. This was a fight, however, sheer willpower could not win. It seemed at long last she had been defeated…But a closer look reveals it is not what it appears to be. Just as the caterpillar spins her cocoon until it surrounds her and she lies dormant inside, to all appearances dead, Nancy too had to die. And just as the caterpillar emerges after fighting a battle to be free of its fragile shell…Nancy too has emerged triumphant. In the time I knew her she was being transformed. Now she emerges, colorful, elegant, and delicate, a remarkable and beautiful creature. Teena Stewart is a published author and artist. She and her husband, Jeff, operate Java Journey a Christian coffee shop ministry (http://www.javajourney.org.) Her most recent book is Successful Small Groups from Concept to Practice. For more info about Teena visit http://www.serendipitini.com. You are welcome to email her with questions or comments at smartwords@embarqmail. 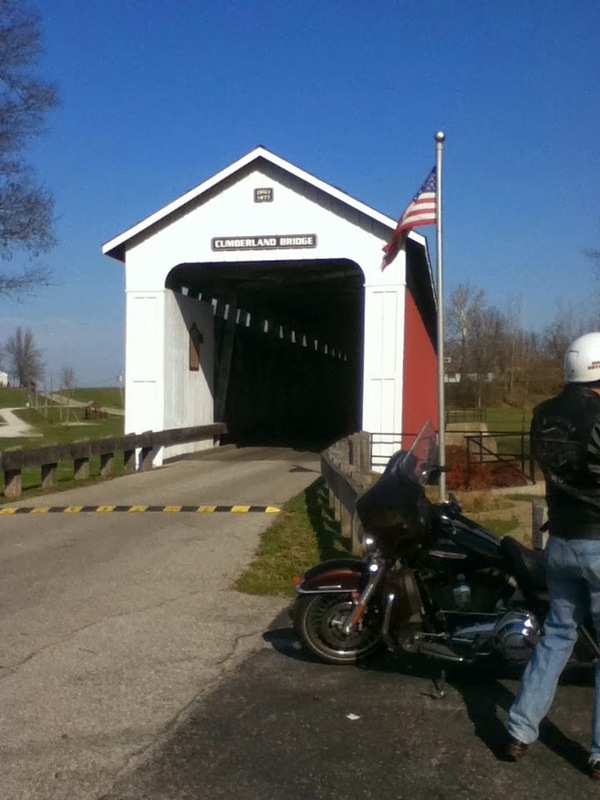 Forks, bends, detours, scenery, and fellow travelers I've discovered while Exploring the Path Home. This is what you'll find on freelance writer and community mental health counselor Nancy J. Ring's blog. That, and a whole lot of wisdom and truths that just leave you breathless. I am having a tough time telling you just one post to read, so let's just say that you should read the whole thing including quotes, favorites, and things. Nancy found the ultimate path Home on March 13, 2010. A native Chicagoan, she graduated with a Master’s in Community Counseling and held her Licensed Professional Counselor (LPC) certification. She worked with adults who have severe and persistent mental illness, so she knows a lot about how it can be tough to find the path home. She worked at the same place for nearly 10 years and loves that her work focuses on helping people achieve their vocational goals, as well as working on emotional health and well being. Besides work she also volunteered in her church and worked on setting up a food pantry. When asked about how all of this affected her writing she said,"Helping people become who they are meant to be is a theme that runs through my writing, my counseling, and my ministry." I know I gain many insights into myself and my own writing from Nancy and her blog and I will miss her so much in our group where we shared so much. 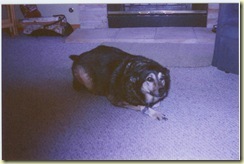 She is in a great place now and wouldn't want to come back, so someday I will go to her and that comforts me somehow. She has been a writing buddy in my Struggling Artists of Literary Talent (SALT) for many years, so I love her as a sister, and my fellow SALT sisters are suffering today along with me. We got together over 10 years ago to critique each others' writing, but we bonded as sisters and cared about and prayed about every aspect of our lives. She was the youngest of the group, but seemed wise beyond her years. Nancy wrote nonfiction articles for women, adults, and teens on all kinds of inspirational, Christian living topics. She's also written Sunday School curriculum for her church and award-winning grants for her vocational program at work. Her blog started as a way to get back into writing after she had finished graduate school. Nancy said, "It’s helped me find my voice, connect with other writers, and helped me identify writing topics I might not have otherwise considered." Sometime back I interviewed Nancy for my blog, When I Was Just a Kid. I think it's appropriate to share that interview again. I want to celebrate her life, which was lived to the fullest. Amen. Childhood Ambition: When I was a kid, I wanted to be a doctor, a gymnast, a scientist, and an artist. Sadly, I wasn’t very good at any of these things. When I discovered how much math was required to be a scientist or doctor, I ditched those goals right away. I still like gymnastics and art, and I’m still not good at either one of them. Fondest Memory: Ok, I’m having trouble coming up with one stand-out memory. I think it’s mostly the little memories that I’m fond of. Our family Christmas traditions, getting ice cream or Gene & Jude’s hot dogs when me & my brother had good report cards, and having my aunt’s family over for brunch after church on Sunday. I’m sure there’s more extraordinary memories, but these are the ones I recall at the moment. Proudest Moment :A lot of my proudest moments seem to be related to academics. I guess I’m a nerd. When I was in 7th & 8th grade, I won 3rd place in a spelling bee. At the time I was disappointed that I didn’t place better, but I’m proud of that now. I was also a finalist in a regional story writing contest. I’d been interested in writing ever since I’d read The Hobbit back in 3rd grade, but this was the first time I received real, genuine, encouraging feedback about my writing. Even though I was only a finalist, I was proud of this at the time. Go figure. Biggest Challenge as a Child or Teen: Most people would think my biggest challenge was growing up with a disability. Spina Bifida has always been a part of my life. I’ve never known life to be any different, and being disabled is only an issue when it’s an issue. Snow on the ground creates an unpleasant experience, but it’s hardly the biggest challenge I’ve ever encountered. The quadratic formula, now that’s a challenge. Does anyone know why we needed to learn that thing anyway? My First Job: My first job was as a telemarketer for a basement waterproofing company. Cold calling at the age of 14. Despite the fact that most of the calls were rejections, we had fun in the office. Our boss was young himself & would do all sorts of goofy tricks to try to keep our spirits up. He taught me to think outside of the box when you need to address a problem. And if that doesn’t work, go next door to the Hostess shop and buy everyone Twinkies. Childhood Indulgence: As a kid I was always asking to stay up late to read “just one more chapter.” Also, when my dad was working overnights as a paramedic, on Fridays Mom & I would get pizza and a movie. I looked forward to those nights all week. Favorite Outfit as a Child: Well, there’s the tea bag Halloween costume my mom made me out of pillowcases. (No, I do not have a picture). I also had a mint green Easter dress I loved when I was about 5 or 6 years old. It had pink ribbon, and lace, and a layered, pleated skirt. I loved that dress. Favorite Childhood Movie: I loved The Muppet Movie. I still do. Kermit the Frog is wonderful. Favorite Childhood Book: I read all the time when I was a kid. My mom would buy me chapter books at the beginning of a shopping trip to keep me quiet and by the time she finished shopping I was always asking for another one to sustain me over the car ride home. So while it’s hard to pick just one book, I’d have to say my favorite is The Hobbit by JRR Tolkien. This was the book that made me decide I wanted to be a writer. I remember reading the opening paragraphs and trying to figure out what the magic stuff among the words was, what made those words do what they did. Favorite Childhood Activity: Well, there was reading, of course. And playing on the swings. I still loved to do that. The neighbors across the street had a swing set, but we never did. When my parents did some renovating in the backyard I lobbied for a swing set. Instead, they put up a 2-car garage. My beloved lilac bush was also sacrificed in favor of this ugly, mustard yellow & brown monstrosity. Mom would say that it was “her” lilac bush, but it’s not like she lobbied to save it from the invasion of the garage. 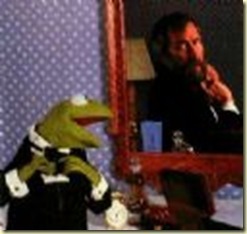 Childhood Hero: I think my favorite childhood hero would have to be Jim Henson. I mentioned this at work the other day, and several of my clients laughed at me. I just think the guy was a creative genius. Kermit the Frog & I seemed to understand each other, and that was very important to me at times when I was growing up. Favorite Childhood Ritual: Well, there’s the pizza & movie nights with Mom that I mentioned. At Christmas, our family would also hold auctions, where the kids would get to bid on dime store items. For some reason, that was almost as exciting as opening presents. I think I liked knowing that it was something special about how our family celebrated the holidays; something other families didn’t do. She has also written for Discipleship Journal, Young Salvationist, Christian Standard, The Christian Communicator, and other publications. "Both my jobs (writing & counseling) are driven by a passion for communication. 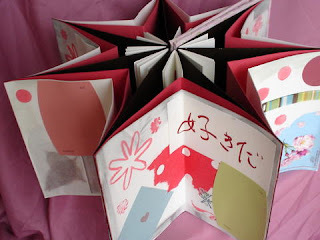 I’ve also recently discovered the art of making handmade books. I’m very interested in how making books can be used in a therapeutic manner. I think handmade books can be a great bridge between my interests in writing and counseling." 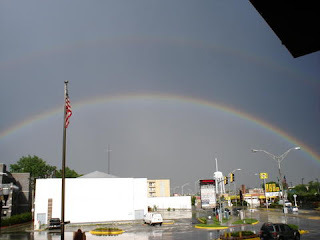 Here's a rainbow from her balcony in Chicago that God hung just for her. 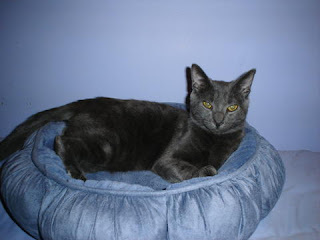 Nancy was able to adopt a gorgeous gray velvet cat whom she named Katerina. Her tales of Kat's adventures kept us entertained! Nancy was very creative and was able to sell some art. This is a "star book" she created. This one above is entitled, "She wondered if her eggs would hatch" and has "faith, hope, love" on the eggs. 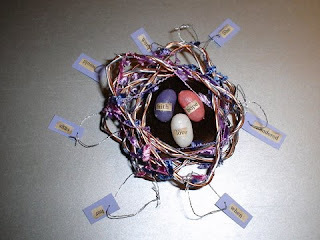 Nancy definitely hatched those three eggs in her own life.She had a delightful sense of humor and whimsy that came through everything she did. 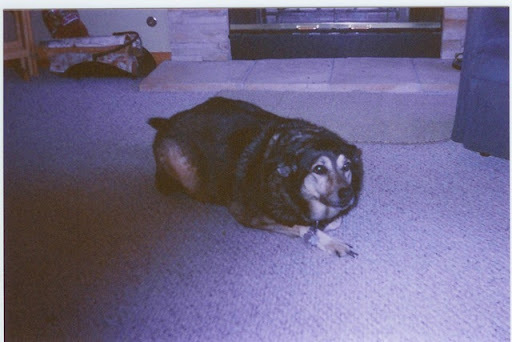 This is Nika, her dog who went on before her. Maybe even now she is running with Nika in heaven. It's a heartwarming thought for me. 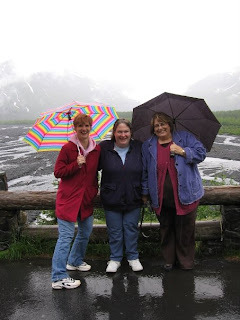 Nancy loved periwinkle, bears, her Katerina the Kat, lilacs, JRR Tolkien and The Hobbit & Lord of the Rings, Kermit the Frog, purple, Levenger pens, Alaska, moose, writing, making art and art books, butterflies and rainbows, as well as her friends and family. A fascinating person, full of warmth and wisdom and whimsical dry humor, I will miss her but am reminded of her each time I encounter any of these things. Someone asked me to give examples of "voice." In 2005 the writers' group, Chi Libris, published a book called What the Wind Picked Up. The point was to show how you could take a single beginning sentence and how each author would come up with their own unique story. In doing so each author spoke in their own unique voice, too. "The wind was picking up." So if you were given this assignment, what would you come up with? Try this exercise. You have to make all the same decisions that you do for a long story--genre, characters, plot, setting, conflict, etc. Let me know if you try this. Also, maybe it will be the start of finding where you need to be. You'll be using your own experiences, your interests, your humor or drama, your mood, YOUR STYLE and most importantly YOUR VOICE. Do not write more than 6 pages, but try to at least write 1000 words. Remember, this is a short story. If you really get going and develop it into a full length book, let me know that. You don't have to share your story, just let me know if you tried it and what you discovered about your voice. I'll try to come up with a quiz on voice in the meantime. "The face of the river, in time, became a wonderful book . . . which told its mind to me without reserve, delivering its most cherished secrets as clearly as if it had uttered them with a voice. And it was not a book to be read once and thrown aside, for it had a new story to tell every day." ...I hear it with my whole heart, as if it were my own heartbeat. There are some authors who do that for me. Do you have insights on voice? Do you have questions about your voice? Whose voice (an author) do you feel is close to your voice? Which author would you WANT to have a voice like? Share some of your favorite books with us. Do you think you have a voice anywhere near your favorite authors? It's true that as we go along we discover new things about ourselves, as well as finding out about wherever we are. I'm getting ready to speak on Saturday. I've done this many times before on various topics. I taught elementary students for 10 years, Sunday school and have led Bible studies. I thought about just pulling out something I'd talked about before, but this group is special to me. I decided to dig around in my past and into my scads of published and unpublished writing. And I found something that I wrote years ago, but never sold. I think it just didn't have a good hook, but it fits the topic I am to address on Saturday. So, while I worked on what I will say, I got to thinking about that pile of writing I have. Wow. I've written a lot. And I've helped a lot of others get published. But for my own writing, I tend to just toss it off and not bring it on the journey. I think it's time to look at the journey and see how where I've been in the past might help on today's road. When I started this blog at the urging of a friend, encourager and mentor, Terry Whalin, I had to pick a blog address and it became Christian Book Scout. That is the one thread in my life I continue to pull. It's who I am at my core, though at the time I was just trying to just pick anything. (I didn't even post anything on this blog for a whole year!) I thought several times that I would quit this blog, but I had started the blog to find my voice. That's all it was supposed to be. A voice-finder. Not a journey. But I'm a scout, and I do scout out--talent, writers, stories, books, hearts, authors, dreamers, helps and in that search, I give you a look, too. I never realized that before now. So, expect me to delve deeper into that aspect of myself. Scouting out the stories in the writing universe.Right here. With me. Where are you on your journey today?